Notice posted by the IRSA in February 2019 asking for donations to the "equip a jihad fighter" project. Donations are accepted at the management headquarters in Beirut or at local branches in Lebanon (Bint al-Janoub Twitter account, February 5, 2019). Campaign for donations "of the price of a bullet" (komi_088 Twitter account, February 16, 2015). Donation envelope along with a student's apology for his small donation (Sajed Twitter account, February 10, 2018). The logo of the Islamic Resistance Support Association, with the word “support” in red. The upper part of the pen is a rifle stock. At the upper part of the logo is a semi-circle symbolizing the globe of the world. 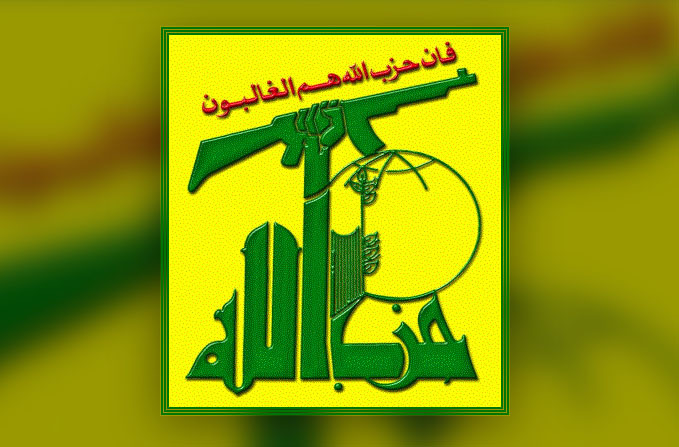 The world globe is also part of the logo of Hezbollah as well as of Iran-affiliated organizations to emphasize the global nature of their activities. The IRSA is a Hezbollah institution established in 1990 to manage and regulate the organization’s fund-raising enterprise. Originally the institution was subordinate to Bayt al-Mal (Hezbollah’s bank, but IRSA’s subordination has been changed). According to unconfirmed information, today the IRSA is directly under the control of Hezbollah secretary general Hassan Nasrallah. For the most part, the funds collected by the IRSA are used to buy weapons and equip Hezbollah’s operatives. Sometimes they are put to other uses, such as inculcating the population with the “culture of resistance” [i.e., terrorism] and brainwashing the younger generation with the radical Shi’ite Islamic ideology of Khomeini. Soliciting funds for the IRSA is authorized by the Lebanese government, based on the license it received when it originally registered with the ministry of the interior. The IRSA customarily collects large sums of money in Lebanon from private individuals, in public places and during public events. Those include businesses, mosques, educational institutions, gas stations, shopping centers and roadblocks. Money is collected in thousands of collection boxes in homes and businesses, especially in the Shi’ite population. In addition, every year IRSA hold a fund-raising campaign to purchase weapons. Some of the IRSA’s activities are conducted with Hezbollah’s other social-economic institutions such as the building jihad fun (jihad al-binaa), the fund for the wounded and the shaheeds’ institution (muassasat al-shaheed). 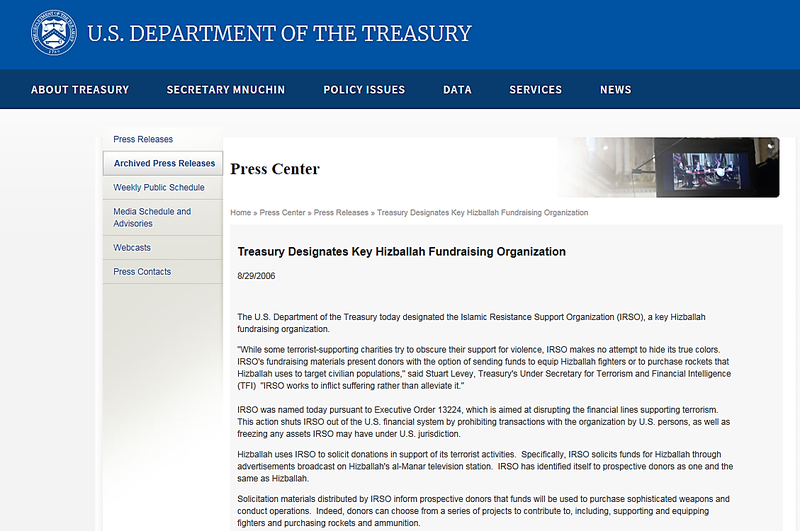 The organization is careful not to expose the way donations are transferred because since August 2006 it has been designated by the United States as a “key Hezbollah fundraising organization” (See Appendix B). Hezbollah is designated by the American administration today as a terrorist and international criminal organization. In addition to raising money, the stated goal of the IRSA is to “spread the culture of resistance” [i.e., the culture of terrorism] to civilians, especially the younger generation. It brainwashes them with Iran’s radical Shi’ite Islamic ideology and the concept of a struggle against Israel, the United States and the West in general in the spirit of Iranian Shi’ite Islamic ideology. At the beginning of every year the IRSA holds a campaign to solicit funds for Hezbollah called the “equip a jihad fighter” project. The campaign is conducted through the social networks and Hezbollah’s media, including al-Manar TV and the official Hezbollah website. As a means of caution the IRSA has neither a website nor an official Facebook page. Money is solicited through notices and videos calling for donations from Lebanon and abroad, asking people to call IRSA branches in Lebanon (without giving bank account numbers). 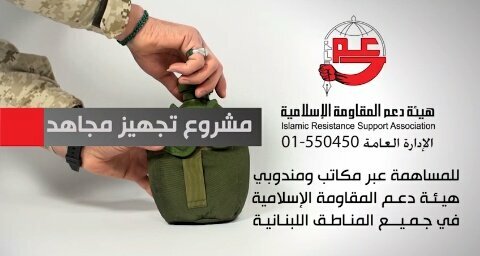 The following pictures are from a short video issued by the IRSA in February 2019 asking for donations to the “equip a jihad fighter” project. At the top of the pictures are quotations from the Muslim oral tradition (hadiths) about the rewards for equipping a jihad fighter. The narrator explains that jihad fighters need equipment and anyone who cannot personally fight can contribute money. The contributions can be delivered to representatives of the IRSA in various region in Lebanon, or by calling the head office in Beirut (Abbas Abbas’ Twitter account, February 5, 2019). The video shows weapons and military equipment bought with donations. The inscriptions above the explosive vest and the rifle read, “Anyone who equipped a jihad fight, with a wire or a needle, Allah will forgive his previous and future sins” (Shi’ite hadith). 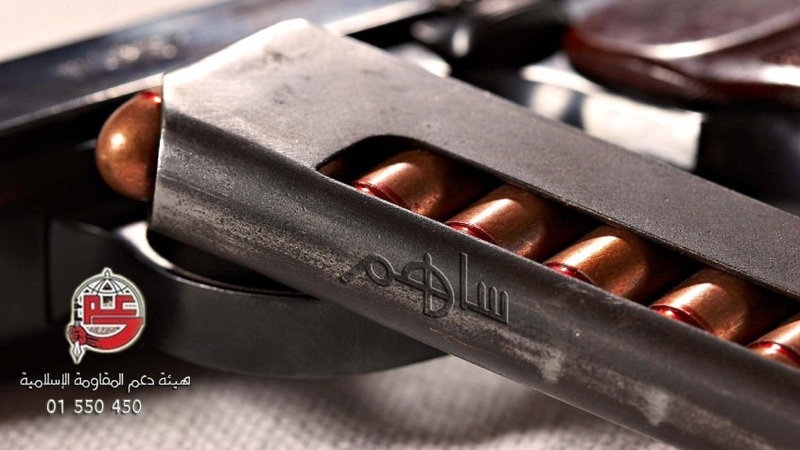 The inscription above the bullets reads, “Whoever rises to struggle for the sake of Allah, the more he is equipped by the money of another, the more jihad virtue he gains; and whoever equipped him for the sake of Allah has the virtues of a jihad fighter, and both of them are virtuous” (Hadith of Muhammad). Right: IRSA notice from February 2018 requesting donations to Hezbollah for the “equip a jihad fighter” project. It reads, “We will thank you for your participation [i.e., donation]”, #participate_resist” (Qawem Twitter account, February 3, 2018). 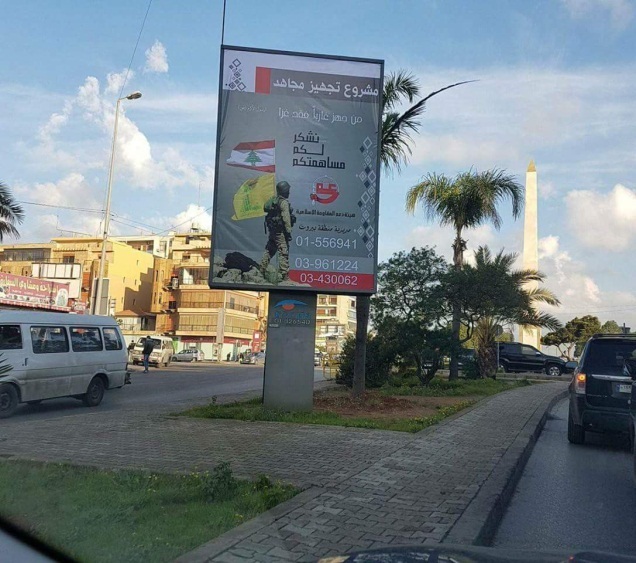 Left: IRSA street sign in Lebanon requesting donations for Hezbollah’s “equip a jihad fighter” project (RASSAF Twitter account, January 2018). 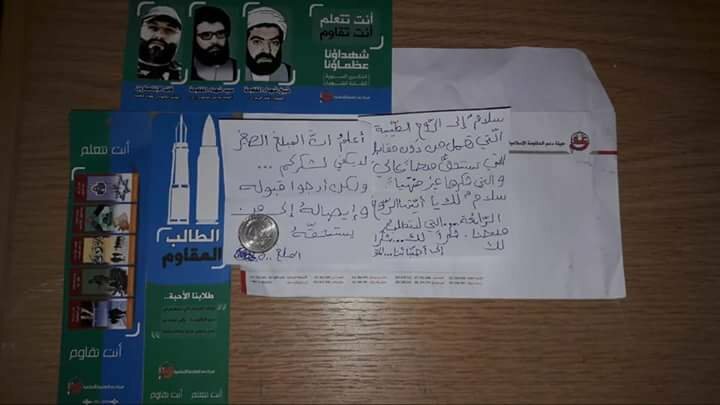 At the beginning of February 2019 Hezbollah and the IRSA published instructions for donating to the project. The IRSA published the telephone numbers of its main offices in Lebanon (Beirut, South Lebanon, the Beqa’a Valley, Jbeil and Kesrouan, al-Metn and Mt. Lebanon). A telephone number with the Lebanese country code was provided for donors from abroad. 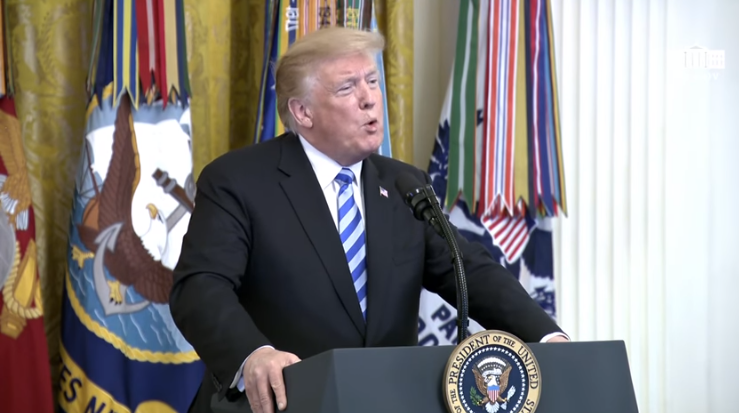 No bank or other institution name appears in the notices, in ITIC assessment in fear of the sanctions imposed by the United States on anyone who supports Hezbollah. In all probability instructions for transferring funds are given only during telephone conversations with the IRSA management or representatives in its branches. 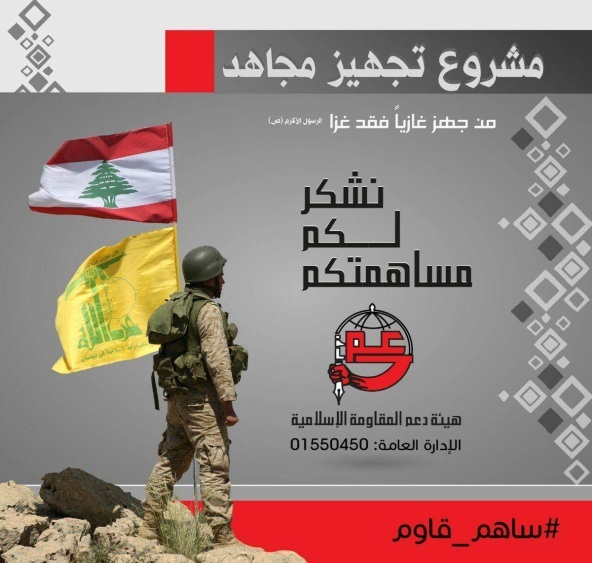 Notice on the Hezbollah website gives instructions for calling the IRSA and the telephone numbers of its branches in Lebanon for donating to the “equip a jihad fighter” project (official Hezbollah website, February 6 2019). The IRSA is an institution for collecting donations to Hezbollah. It was established in 1990 and received a license from the Lebanese ministry of the interior to operate in Lebanon (al-Janoubia website, August 8, 2011). IRSA was based on a volunteer network of the residents of the Shi’ite suburb in southern Beirut (the Dahieh) in 1985-1986. The stated goal of the IRSA is “to spread the culture of the resistance [i.e., the culture of terrorism] by having civilians join [its] projects and activities.” The objective is “continue the resistance, its spirit and culture in future generations” (al-Janoubia website, August 8, 2011). The IRSA’s subordination is unclear, but at least one Lebanese source claims it is directly subordinate to Hezbollah secretary general Hassan Nasrallah (al-Janoubia website, April 22, 2015). The IRSA does not have its own website or a Facebook page, and its activities are made public by the media affiliated with or supporting Hezbollah. The religious basis for the IRSA’s soliciting of funds is Islamic law, which states that non-combatants (women, children and the aged) may participate in jihad by donating money or property (al-Akhbar, March 10, 2018). The IRSA repeatedly states that a donation is not charity, but rather a contribution aimed at honoring the donor and giving him a sense of belonging. That sense of belonging is no less important that the monetary value of the donation (al-Nabatieh News Network, March 10, 2018). To instill the concept the IRSA often uses three religious quotations (Baqiyat Allah, Number 289, October 1, 2015): “Whoever equips a jihad fighter, it is as if he himself fights in jihad” (from the Islamic oral tradition attributed to Muhammad, taken from the website of the Imam Sheikh Ibn Baz); “It is a [religious Islamic] duty to sacrifice wealth for jihad” (al-Nabatieh News Network, July 6, 2016); and “Rise up to struggle by sacrificing your wealth and lives for the sake of Allah” (Qur’an, Sura 9 (al-Tawbah), Verse 41). The IRSA is headed by a body called the general management (Hezbollah website, September 29, 2016) which is headed by Haj Fadhel Bazon (Oh Tyre website, December 16, 2018). He was formerly in charge of information for the IRSA (website of the Lebanese National Information Agency, February 13, 2013). Financial and administrative director: Sayid Hussein Abdallah (as of November, 2018). Department of Information and Connections, also called the Department of Activities and Information: headed by Ahmed Zien al-Din (as of March 2018). Department of Women’s Activities: in the past headed by Haja Umm Mahdi (as of October, 2015). It is unknown if she still has the position. South Lebanon Branch: headed by Haj Zein Abadein Dakhlalla (formerly mayor of Qana). Beqa’a Valley Branch: formerly headed by Abbas Taeis. Two others who worked at the branch were Jamal al-Yahfoufi (as of August 2017, mayor of the town of Nakhleh) and Haj Yusuf Awadah (as of 2017). Collection boxes: There are collection boxes in private homes and businesses, and at the sites important for Hezbollah supporters. Those include the museum in Mleeta in south Lebanon; the shrine in Beqa’a of Sayid Abbas Mousawi, the former Hezbollah secretary general; the shrine of Sayida Khoula in Baalbek, and the shrines of other shaheeds (al-Janoubia website, August 8, 2011). Public activities where funds are solicited: Mainly at the festive meals breaking the Ramadan fast to which rich men and public figures are invited. Funds are also solicited at cultural events like song festivals where the box office proceeds are dedicated to Hezbollah fighters. Monthly subscriptions for workers: The ITIC has little information about the system and how it works. It may be assumed that it occurs mainly in institutions influenced or controlled by Hezbollah (for instance, the shaheeds’ institution). Religious tax: A familiar source of income for Hezbollah. This type of tax includes the “1/5 tax” (an Islamic duty); payment given by pilgrims to the shrines of Shi’ite saints; and donations received from senior Shi’ite religious figures (website of the al-Mustaqbal channel, May 10, 2017). 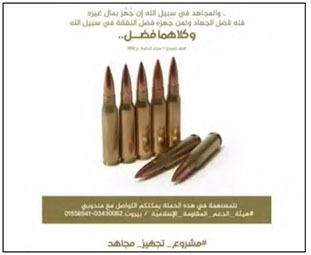 By telephone: The “equip a jihad fighter” campaign publishes the telephone numbers of its branches and the management in Lebanon. In ITIC assessment, potential donors call the numbers and are given specific verbal instructions for transferring funds. By paying in cash: According to the IRSA’s manager of administration, volunteers distributed donation envelopes throughout Lebanon (al-Akhbar, March 10, 2018). By buying information materials (booklets, CDs): Such materials can be bought from the IRSA’s regional representatives. By donating to the al-Qirdh al-Hassan institution: At the beginning of 2019 it became possible to donate to IRSA through the al-Qirdh al-Hassan institution. It is a Hezbollah institution that lends money to the needy with easy conditions for repayment. It is possible to donate through a bank account whose number is 8142401 (Mr. Alex Twitter account, January 31, 2019). Note: It is apparently an internal al-Qirdh al-Hassan account, or a partial account number whose others digits are known to donors. According to IRSA publications of, it can be assumed that in most cases Hezbollah uses the money to buy weapons and equipment. In addition, the money is used for ideological indoctrination. 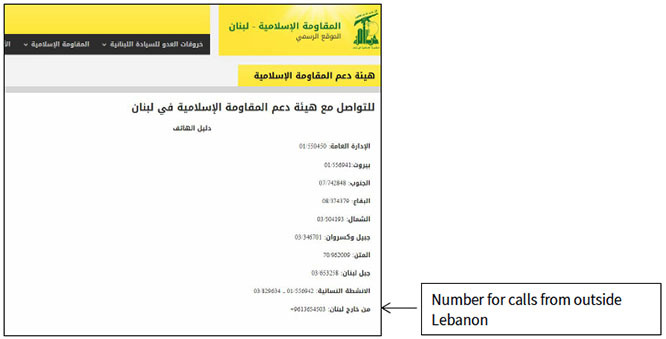 According to the Lebanese website, some of the money is used to cover the medical and social needs of Hezbollah supporters (al-Janoubia website, November 5, 2018). However, the IRSA has other uses for the funds collected: they are used to indoctrinate the importance of shahada (self-sacrifice for the sake of Allah); to encourage the educational institutions of Hezbollah’s supporters; to encourage Hezbollah-affiliated journalists and media outlets; to produce propaganda and informative material for radio and TV programs; to support women’s activities ; o maintain contacts with Shi’ites and non-Shi’ites who do not belong to the Hezbollah but support it. The IRSA also solicits donations from Shi’ite communities and businessmen abroad. It has a Foreign Department headed by Haj Muneir Qashmar (Abu Issam) (as of November 2018), which is also called the International Relations Department. Among the phone numbers listed for donations there is one with a Lebanese area code for donors from abroad: +9613654503. The number has remained unchanged since September 2016.